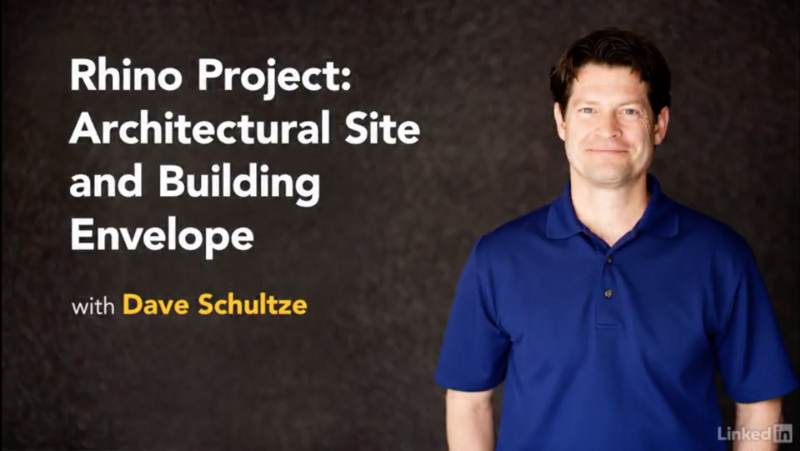 Dave ‘Professor3D’ Schultze is proud to announce the release of his ninth online course for lynda.com, Rhino Project: Architecture Site and Envelope. Running 1 hours and 12 minutes, this course is a brand new ‘lunch-hour / project-format’ designed by the educational gurus at lynda.com to be watched in one sitting. In this 12-video course, the focus is on advancing your Rhino modeling and workflow skills. Students will first create their site topography with lofting and contours. Then, they build the building envelope with walls and a foundation, and later with floors and stairs. Using a fun, retro space-age design, Dave shows quick ways to build glass curtain walls and even move openings like doors and windows on the fly. He also provides his patented tips and tricks for a faster, more efficient workflow in Rhino. Those interested in previewing the course — or any of the other 4,000+ courses on lynda.com — are invited to a free 10-day trial. Free? Yes, I just said it was free. If you like this course, here’s a link to the full list of nine lynda coursesby Professor 3Dave. You need to be a member to watch the whole course, but the first video [seen above] is free for previewing. If you join, lynda.com is only $25 per month and you can cancel anytime.